FAR ( http://farmanager.com/) is a file manager with a built-in editor. A plugin, Colorer ( http://colorer.sf.net/) is used for syntactic highlighting. Colorer has a powerful syntax description language, based on XML and regular expressions, which define the language's syntax rather than coloring rules - thus, it can also create an outline (for quick navigation) of the edited document. 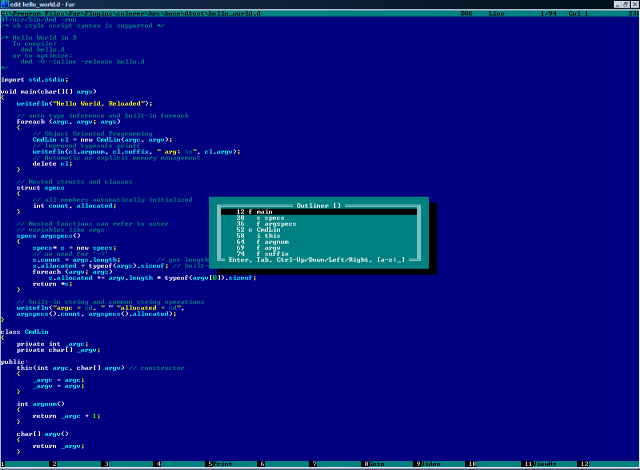 Colorer is also available as an optional syntax highlighter for Eclipse; see Colorer's home page for more information.